As a child, I had several older relatives who used the term “johnny,” as in “I need to use the johnny before we get in the car.” Its meaning, of course, was toilet. I thought it was a funny word, though I never used it much myself. I explained that it was a potty set inside a little wooden shed. A silhouette of the crescent moon was often carved into the door to let air and light in. I told Josephine that a johnny-house was sometimes called an outhouse and that it smelled bad because it didn’t flush. That’s why it was built way back in the yard. 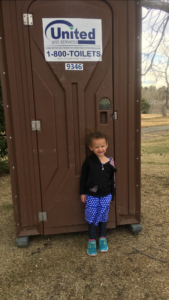 I said I’d noticed that the playground at a school in her neighborhood had a porta-potty, which is pretty much the same thing as a johnny-house. “Can we go there and see it?” she asked. Thus the idea for our afternoon adventure was hatched. After rest time, we put on running shoes and sunglasses and sweatshirts. We loaded snacks and water into a backpack. Then we set off for the playground. It’s a good one, filled with all kinds of fun things to do. At first, Josephine was too distracted by all the slides and swings to be interested in an outdoor toilet. But when she was finally ready for a rest, we ventured over to the porta-potty near the basketball court. It was made of plastic, not wood, and had no crescent moon carved into the door. Inside, it was and clean and well-stocked with toilet paper and hand sanitizer. Happily, there was no bad odor at all. Somewhat to my disappointment, Josephine wasn’t interested in trying it out. “I don’t need to go,” she said. “I promise.” But at least she can now say that her Grandmother once walked with her to a johnny-house.